Pacific Northwest National Laboratory had a strong showing among the industrial partners that proposed projects under the Lightweight Materials National Laboratory Consortium’s Directed Funding Assistance program. In one approved project, Prediction of Aluminum/Steel Joint Failure, ACMD Division’s Computational Engineering group will work closely with General Motors Co. to develop a predictive performance model of dissimilar metallic spot welds for joining aluminum to steel. The project is the latest collaboration between the automotive leader and PNNL’s computational engineers, seeking innovations in materials or manufacturing processes to enable significant weight reduction. LightMAT is a network of 10 national laboratories with technical capabilities highly relevant to lightweight materials development and is sponsored by the Department of Energy, Office of Energy Efficiency and Renewable Energy’s Vehicle Technologies Office. PNNL has pioneered work in joining dissimilar materials, such as this sample and model of aluminum and steel joined via friction stir scribe welding. The new LightMAT DFA-supported project between PNNL and GM Research & Development will focus on new predictive performance models of resistance spot welding to enhance ongoing lightweight materials and joining work. Enlarge Image. Currently, the most critical factors for predicting joint fracture modes in joints made of dissimilar aluminum and steel metals are unclear. This uncertainty translates to significant development time when seeking to expand this technology to additional alloys and sheet thickness combinations. GM will engage PNNL for its capabilities in measuring localized material properties to develop predictive models of dissimilar metallic spot joints, as well as their behavior during fracture. The focus on failure mechanisms of advanced welding processes, such as interfacial (entire weld fails through the weld plane) or button pull-out (entire weld nugget pulls out of the sheet) fractures, will examine the functions of alloy, sheet thickness, faying interface (surface in contact at a joint) microstructure, and thermal-mechanical treatment of the weld nugget and heat-affected zone. The ability to model a given joint structure and accurately predict lifetime performance could lead to a 25-percent reduction in development time, affording cost savings, improved time to market, and a better product for consumers. 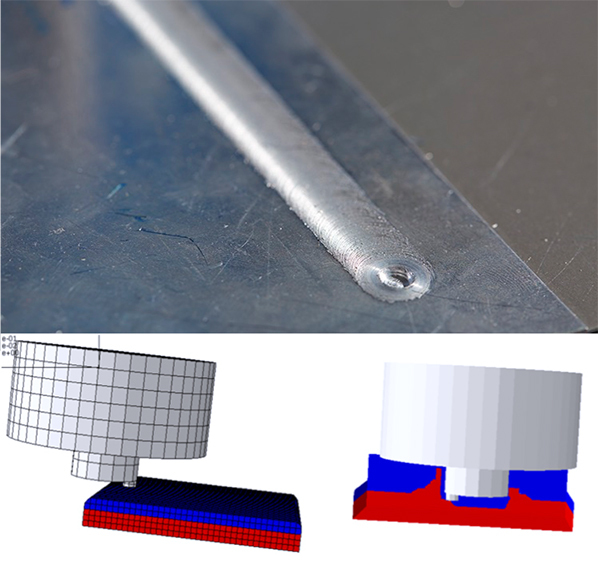 Prediction of Aluminum/Steel Joint Failure was accepted for LightMAT Directed Funding Assistance under Topic 2: Design for Dissimilar Material Joints.